Many soldiers wounded during their military service in Israel have found their dreams, plans and bodies suddenly shattered. They then face a long and challenging road to rehabilitation. With the help of Beit Halochem, they work hard to rebuild their bodies and lives. Facilitating these steps is the highest priority of the Beit Halochem rehabilitation process. A minimum gift of $1,800 USD is requested to support either a named Academic Studies Scholarship and/or Sports Excellence Scholarship for Excelling Disabled Athletes. The disabled athletes who earned these awards are an inspiration to us all. Scholarship support is an ideal way to offer a direct lifeline to someone who has sacrificed so much for Israel. For many of the war disabled, and civilian victims of terror attacks, the opportunity to further develop academic skills is crucial to independent living. Supporting them during their academic studies helps empower their successful achievements. Applications for Academic Studies Scholarships are sent to the scholarship committee annually for each completed academic year. The scholarship amounts allotted to any specific individual vary according to need, disability and other factors. In December 2018 at Beit Halochem Tel Aviv, for example, we awarded 518 scholarships of academic and vocational training, as well as pre-academic preparatory courses. The total amount awarded was $589,811 USD. Another 32 creative arts and culture scholarships were awarded, totaling $19,852 USD. Total 2018 Academic Scholarship support distributed at this ceremony: $609,663 USD. Being involved in sport activities, particularly in competitive sports, has a significant positive impact on the mental, physical and social aspects of the rehabilitation process. Competitive sport for the disabled has expanded, become more demanding, and is now a worldwide movement. Scholarships are awarded in the following categories: Paralympic Team members; athletes in non-Paralympics sports branches for achievements in World/European Championships; Young Athletes showing potential; scholarships distributed by each respective Beit Halochem Center; Beit Halochem Scholarships for Athletes from the Periphery; and scholarships to Coaches for Special Achievements. At Beit Halochem Tel Aviv in May 2018, 79 scholarships were distributed to Excelling Athletes and Coaches (14) for their athletic achievements, totaling $140,000 USD. Change a life: Please consider funding a scholarship for a disabled Israeli veteran. Donors of scholarship support typically receive a personal “Thank You” letter from the recipient(s) and an invitation to the awards ceremony, aside from gratitude from a hero of Israel. If you would like to donate a scholarship for Excelling Athletes, or for Academic Achievement, please contact Ella Levine at the FIDV Office: elevine@fidv.org or 212-689-3220. 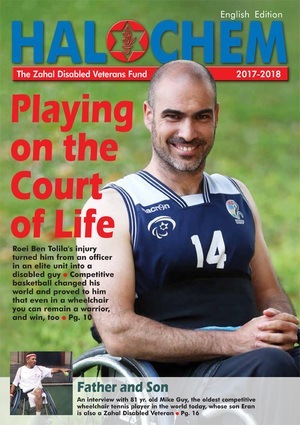 Thank you for supporting Friends of Israel Disabled Veterans.